Enjoy the pond views from the main living area. New hardwood floors throughout the cottage! Fully functional kitchen with refrigerator, stove, and microwave. Enjoy your morning coffee on the screened-in porch. Make use of the picnic table and outdoor grill. 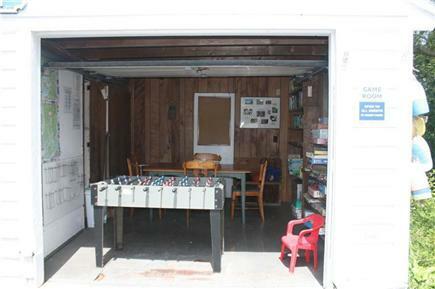 Nauset Haven Game Room. Great for kids! 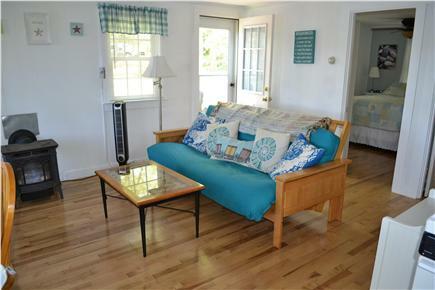 “Escape” to our quiet waterfront cottage in Eastham. Whether you are looking for a fun-filled family vacation at the beach or a tranquil place to recharge, our cottage is the ideal vacation spot. Part of the Nauset Haven community, “Escape” is located on the shores of Minister’s Pond, a 21-acre freshwater kettle pond. 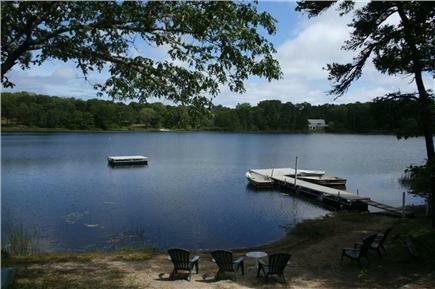 A private sandy beach on Minister’s Pond is only steps away. Enjoy swimming, boating, and fishing. 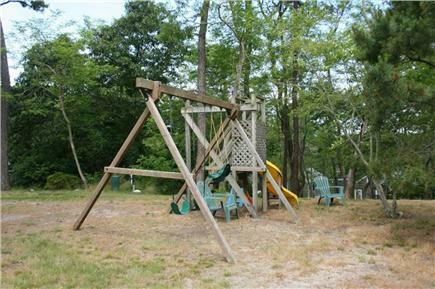 Rowboats, a playground, and game room are some of the amenities included. 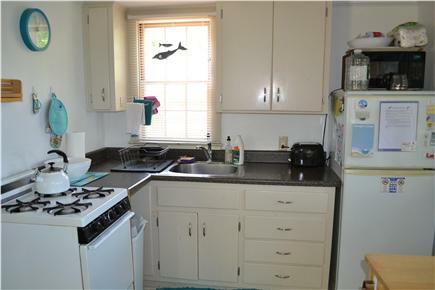 Fully equipped kitchen with microwave and coffee maker. TV with DVD player. WiFi internet access. Air-conditioner and fans. Gas heat. Charcoal grill and picnic table. Linens (sheets and towels) not included. 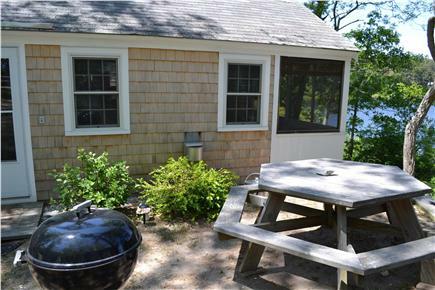 Nauset Haven on Minister's Pond is a charming family vacation complex shared with 9 other cottages. Large pine trees nestle the shores of the 21-acre, freshwater Minister's Pond. 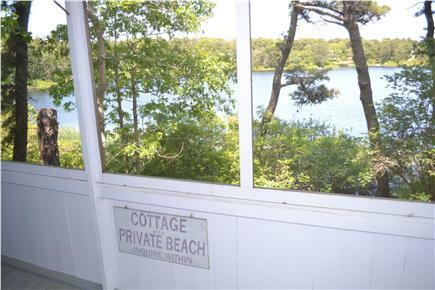 Enjoy Nauset Haven's private, sandy beach. Take a dip and swim to the diving platform. Grab a fishing pole to take with you or fish from the dock. Our community has several rowboats that our guests are welcome to use. You can take one of the boats out for a leisurely ride around the pond or to find your favorite fishing spot. Life jackets are provided. 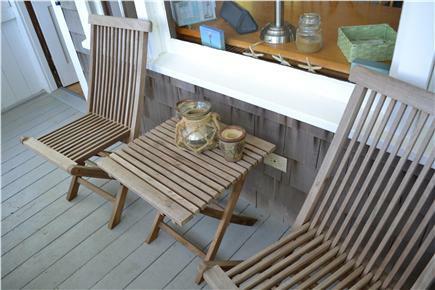 Nauset Haven features a game room stocked with books, games, toys and beach items. There you will find balls to play basketball or volleyball and racquets to play badminton. Shuffleboard and horseshoes are located near the game room. And, there is also a playground for our younger guests to enjoy. This lovely, clean and charming cottage was a great getaway. 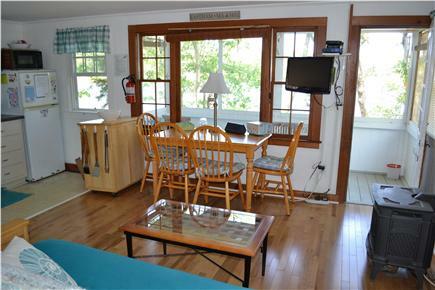 Beautiful views of Minister's Pond from the living room, as well as the screened-in porch. Access to the pond for swimming, fishing and relaxing, and some of the best beaches in the world are just a few minutes away by car. I love this cottage! We stayed in this wonderful cottage while our daughter and her family stayed in another on the grounds. It was a perfect situation. We were together when we wanted to be and yet each had our own home to go to and be alone! The cottage was exactly as described, maybe even nicer than we imagined.We loved it so much, we booked for next year even before vacation was over! It was wonderful to have the pond so our grandchildren could still be in the water when we wanted to sit and relax.Then we had our lovely cottage to return to and enjoy the view, watch TV or just read. Truly a wonderful place for vacation. As we have been coming to the Cape for 38 years, we have our favorites that include First Encounter, Marconi, Thompson Clam Bar and Red Barn pizza. But our tradition is to stop at The Wee Packet in Dennisport for breakfast when we first get on the Cape. We discovered it on our honeymoon! Stop at the little visitors center as you enter Eastham . Not only are there lots of guide books, you can pick up menus and learn about activities in the area. The people the staff the center are full of lots of information themselves. 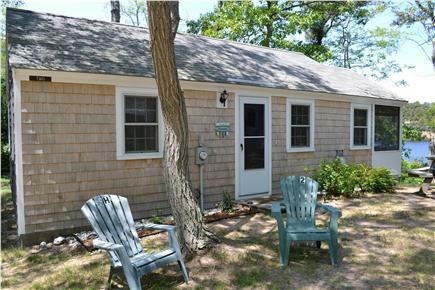 We very much enjoyed staying at Nauset Haven Escape! 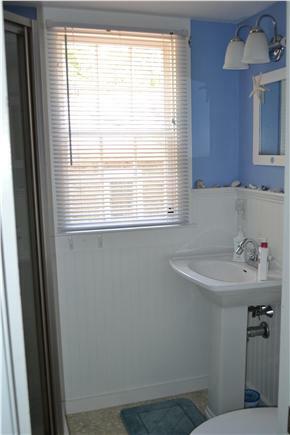 The owners were very responsive to our questions and needs and the cottage was everything we expected. My mother and I enjoyed sitting on the back porch in the evening watching the fish start to feed while my daughters enjoyed the rowboats and the floating dock on the pond. And Eastham, as always, was a delightful town with great access to both the bay and the ocean. Thanks for a wonderful vacation. 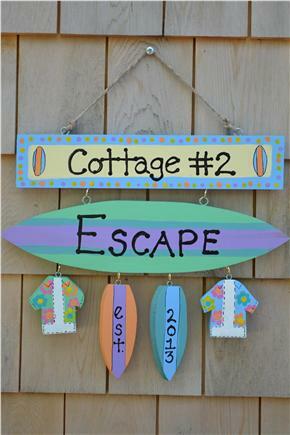 We had a fabulous week in Eastham staying at "Escape" on Minister's Pond. This cottage was the perfect vacation spot for our family. We all loved swimming in the pond with the private beach. It is great to for the day and just stay on property for the day. Our kids loved the playground area and games/activities in the game room. (We loved the fact that there are books, board games, etc on site - saved us from having to bring such items along!) We also enjoyed use of the rowboats. We loved the location of this cottage. Both the bay beaches and national seashore are about a 5 min or less drive. We frequented the bay beaches with our small children who loved the tidepooling and being able to swim in the water compared to the ocean side. We also noted the close proximity to the bike trail, which we did not use but look forward to when our kids are a bit older. Right down the road is Arnold's - delicious fresh seafood and great mini golf! The cottage itself is clean and well-maintained. The kitchen was stocked with all essentials you need for a Cape vacation. We definitely made use of the wifi and were glad of the TV/DVD combo one rainy morning. My husband and I especially loved the screened in porch and would sit out there often. We were also pleased that the cottage presented itself as advertised - we have not always had that experience with vacation rentals. We wanted to spend our vacation in a quiet, restful location - this was the perfect spot. We were able to venture out and sightsee the surrounding areas in the lower Cape (Provincetown, Truro, etc.) But we enjoyed coming back to the cottage just as much, whether to enjoy a glass of wine on the porch overlooking the pond or to play a game of shuffleboard by the gameroom. 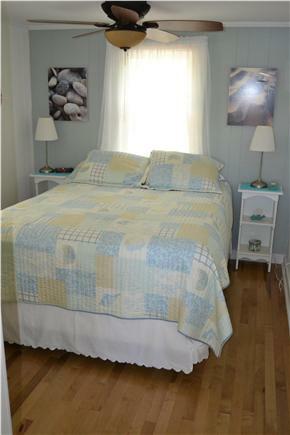 The cottage is well-maintained and clean. 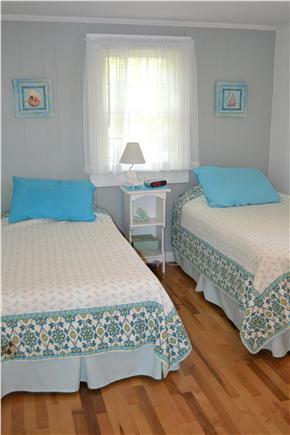 It is the perfect size for a couple or a family looking to get away.